Emperor Go-Kōgon (後光厳天皇 Go-Kōgon-tennō) (23 March 1338 – 12 March 1374) was the 4th of the Ashikaga Pretenders during the Period of the Northern and Southern Courts. According to pre-Meiji scholars, his reign spanned the years from 1352 through 1371. This Nanboku-chō "sovereign" was named after his father Emperor Kōgon and go- (後), translates literally as "later;" and thus, he may be called the "Later Emperor Kōgon", or, in some older sources, may be identified as "Emperor Kōgon, the second", or as "Emperor Kōgon II." His personal name was Iyahito (弥仁). 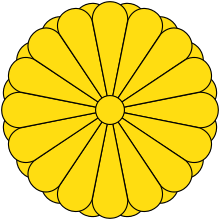 In his own lifetime, Go-Kōgon and those around him believed that he occupied the Chrysanthemum Throne from 25 September 1352 to 9 April 1371. In 1351, Ashikaga Takauji briefly returned to the allegiance of the Southern Dynasty, causing the Southern Court to briefly consolidate control of the Imperial Line. However, this peace fell apart in April 1352. On this occasion, the Southern Court abducted Retired (Northern) Emperors Emperor Kōgon and Emperor Kōmyō as well as Emperor Sukō and the Crown Prince Tadahito from Kyoto to Anau, the location of the Southern Court. This produced a state of affairs in which there was no Emperor in Kyoto. Because of this, Imperial Prince Iyahito became emperor in 1352 with the support of Ashikaga Yoshiakira. During this period, the Era of the Northern and Southern Courts, because of the antagonism between the two competing dynasties, public order in Kyoto was disturbed. The Southern Court repeatedly recaptured Kyoto. Emperor Go-Kōgon was forced to repeatedly flee from Kyoto to Ōmi Province and other places. Around the time that Ashikaga Yoshimitsu was named Shōgun (1368), the Southern Courts power weakened, and order was restored to Kyoto. Also around this time, the Emperor's authority began to show its weakness. On 9 April 1371, he abdicated in favor of his son, who became the Northern Pretender Emperor Go-En'yū. He continued to rule as Cloistered Emperor until he died of illness on 12 March 1374. He is enshrined with other emperors at the imperial tomb called Fukakusa no kita no misasagi (深草北陵) in Fushimi-ku, Kyoto. The years of Go-Kōgon's reign are more specifically identified by more than one era name or nengō. ↑ Titsingh, Isaac. (1834). Annales des empereurs du japon, pp. 302–309. ↑ Sansom, George (1961). A History of Japan, 1334-1615. Stanford University Press. p. 85,88,93. ISBN 0804705259.